Where did this year go? 2015 was a flash. 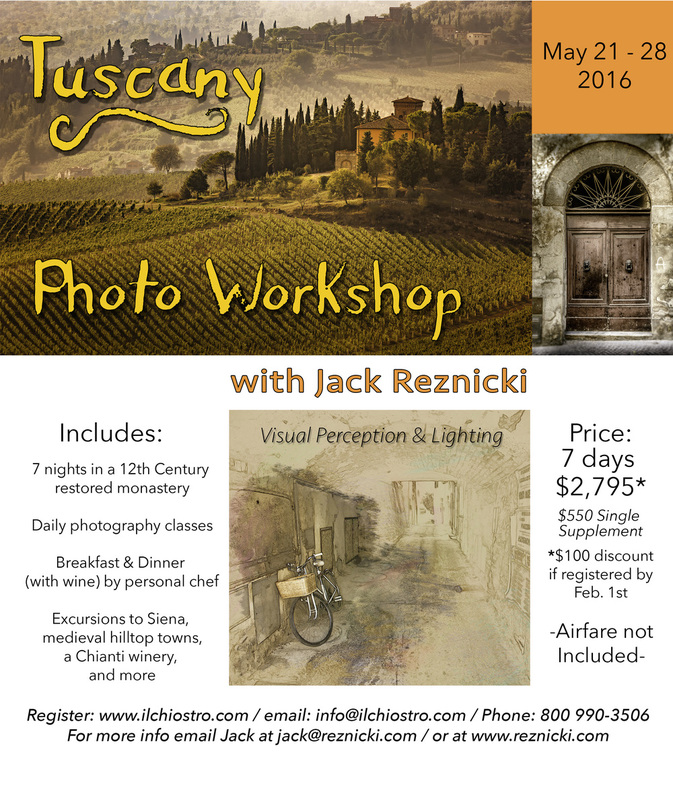 And now I'm thinking about the Spring of 2016 and what better way to spend Spring than a photography workshop in Tuscany? So I'm teaching a workshop. Great food, wonderful wine, and incredible light. We worked to keep the pricing reasonable for this awesome week. Price includes breakfast and dinner (including wine) with the chef in the 12th Century monastery that will be our home base. The class, no more than 10 attendees, will include how to best edit and process your files in Lightroom and Photoshop. The importance of composition in your photographs will be a daily, ongoing discussion to bring your photos from “nice” to “GREAT”. Looking at and photographing the ever changing and beautiful Tuscan light. Understanding composition beyond the Rule of Thirds. Post processing with Adobe Lightroom and Photoshop for both beginners and advanced users. Instruction on photographing with speedlights, simple scrims, and reflectors when needed. A day trip to Medieval Siena to explore and look beyond the postcard. And of course shop! Excursions to nearby hilltop towns such as the walled town of San Gimignano. Email me if you want more info.